Do Your Customers Really Like You? Failing fast leads to startup success. That’s what the lean startup movement and the teachings of Steve Blank, Alex Osterwalder, and others in the customer and business model validation worlds have told us. Many entrepreneurs seek to apply these principles and validate their business models and hypotheses about who their customers are (and how those customers want to buy). But they are accepting token validation from their customers as legitimate. Many would-be entrepreneurs who learn about lean startup or read Blank’s The Startup Owner’s Manual often survey their customers once. If they get a positive response by their customers, they consider their idea (or their morphed idea) to now be validated. This is token validation. One survey is just one pass at validating assumptions; it’s going through the motions but not really believing in the process. Validation is not a one-time survey or an anecdotal discussion with an expert. Real validation needs to be sufficient in quality and quantity. It involves multiple iterations of in-person, one-on-one interviews with target customers. Every major startup pivot and some micro-pivots should be validated. And the process should never stop. After all, the magic answers to success are buried in the brains of the customers, and iterative extraction of customer sentiment is essential to optimal customer validation and the development of a great business model. Entrepreneurs will often hear validation when there is none. They want the target customer to be the real customer and for that customer to validate the pricing, packaging, and channels of acquisition. The entrepreneur will often read deep validation into benign statements. One of the most dangerous type of errors to make in customer validation is to assume that token or superficial statements in the affirmative regarding the willingness to actually pay for the proposed product or service is in fact real. 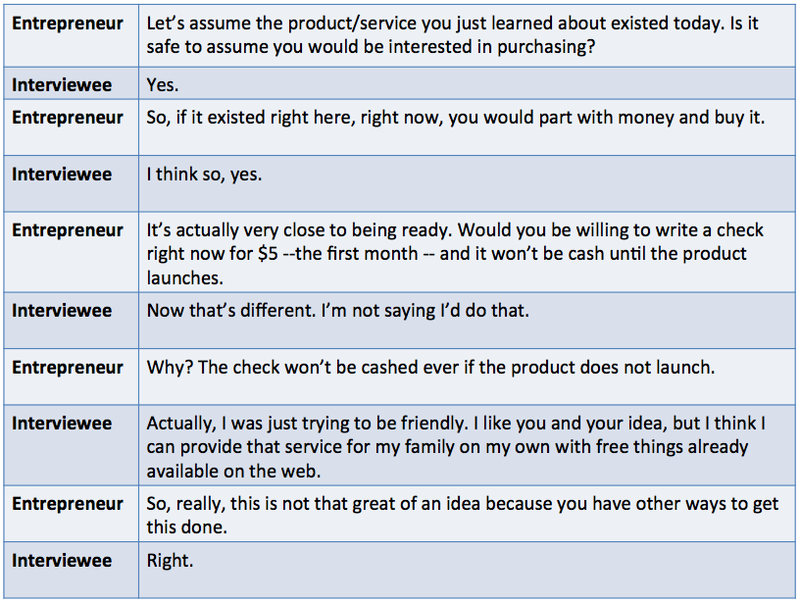 Many interviewees will say they like the proposed product or service and that they would pay for it if it existed now. This needs to be confirmed for real! A company (we won’t mention its name) that went through a seed accelerator claimed significant validation that parents would be willing to pay $5 per month for access to a fun SaaS platform aimed at helping children get outside and participate in physical activity. At the time, there was a lot of hype around childhood obesity and curing it. Michelle Obama brought it to a fever pitch. Almost every parent interviewed said they would pay $5 per month for the product as described speculatively. The company did a few rounds of validating this in the same fashion -- “What would you pay per month for access to this contemplated website?” The company felt that $5 per month was strongly validated. Tens of thousands of dollars and a many months of man-hours later, it came time for these parents to pony up and subscribe. None of them did! What was happening? Why did they say they would pay but now were not paying? The irony is that these entrepreneurs did a better job than most. Too many entrepreneurs do a poor job at validating customers and accept the slightest thread of positive feedback as massive validation. Such behavior by the entrepreneur completely undermines the entire lean startup process. The problem is that most entrepreneurs get so excited with the first couple answers they stop and never really make it real. The trick is to put the interviewee (target customer) in the real mindset of parting with money for a product or service. Make it as real as possible. Then, the truth will come out. Sometimes you will not like the truth, but it will set you free and help you to fail faster so you can find the winning business model. John Richards is an entrepreneur, venture investor, executive manager, and educator. He is also a FunderClub Panel Member. Full bio.